Home Pregnancy Tests Pregnancy Test FAQs What Does A Negative Pregnancy Test Result Mean? What do with a negative pregnancy test? Can a negative pregnancy test indicate something else? What to do if you continue getting a negative pregnancy test result but pregnancy symptoms persist? Can you be pregnant and have a negative pregnancy test? Can negative pregnancy test be wrong? What are the causes of a negative pregnancy test? How to get an early positive pregnancy test? What does a negative pregnancy test mean? A negative pregnancy test means that you’re not pregnant. It is possible to get a false negative pregnancy test result when you see symptoms of conception. Medication, endometriosis, and tubal pregnancy can give a false negative pregnancy test. For an early positive test, you need to use most sensitive test kits. Getting a negative result can be a sigh of relief or a hurting revelation. But do women know that the negative result is more than simply not pregnant? It can tell you about infertility or any other diseases too. A negative pregnancy test (NPT) for the sake of HPT means that you are not pregnant. But if you have been actively trying to get pregnant and yet you keep getting a negative result, it may be a sign of infertility. Another possible cause of a negative test is that you are testing too early. Pregnancy tests detect a hormone (hCG) that comes in the urine of pregnant women. This hormone starts coming in enough quantity after a week from implantation. Implantation is the process of egg embedment in the uterine lining. If you don’t follow the instructions carefully, then you will get a negative test. First of all, an NPT result means that you are not pregnant. At that point, you are not pregnant, according to the test. There is an early pregnancy factor that releases after 48 hours from fertilization in woman’s serum. Doctors can do a super early pregnancy test by detecting EPF in blood serum. But after the release of EPF, there are many pre-implantation events. Very early miscarriages are because of such pre implantation failures. Thus, a beta hCG urine pregnancy test is the first indicator of pregnancy. A woman is chemically pregnant after fertilization, but only after she has 25 mIU/mL hCG in her urine or blood, she is technically pregnant. Before that nothing is for sure. A negative pregnancy test means that you are not pregnant at that time. Unless you are using an expired pregnancy test, a negative is only for non-pregnant women. In case you are using a dilute sample of urine, you’ll get a false negative pregnancy test. The false negative result is widespread during the early stages of pregnancy. 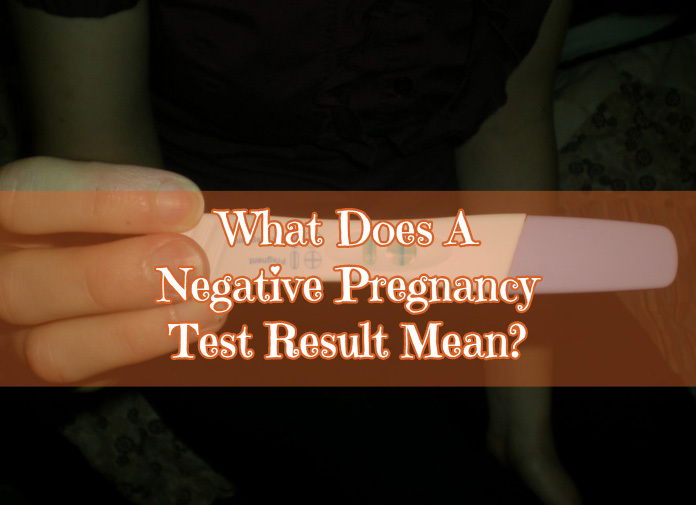 A false negative test means that you are pregnant, but the test shows that you are not. False negative pregnancy tests may also occur if you are undergoing any fertility therapies. This happens because you keep getting a false positive pregnancy test after IVF due to fertility drugs and later on the hCG levels fall down. The hCG levels from developing embryo take time to reach the sensitivity of pregnancy tests. You can also get a false negative if you are on some medicines. Birth control pills for long can cause a negative PT. No contraceptive device is 100% effective and so you can get pregnant even on birth control. The chemicals of birth control in rare cases may influence the rate of production of hCG. Read more: Can birth control affect pregnancy test? After getting a negative make sure that your result is correct. In any case, if you have been sexually active near your ovulation days then take a second pregnancy test. The placenta after implantation produces hCG hormone. This hormone goes on doubling every 48-72 hours. If you have an NPT, then retake the test after two days. An NPT could mean a lot more than just ‘not pregnant.’ If you get 12 days late negative pregnancy test, then it is not something to worry about. A positive pregnancy test at 3 weeks is possible. It is because every woman takes different time to produce a sufficient quantity of hCG. A negative result with cramps could be because of ectopic pregnancy. If you get 55 days late negative pregnancy test, it could be because you are undergoing Menopause. If a young woman has 55 days late negative pregnancy test, then she may be having an early Menopause or Perimenopause. Pregnancy symptoms and NPT happen during menopause. They are similar to the point of time and then diverge undoubtedly. A negative result can also be because you are breastfeeding and prolactin levels are high. A late period negative test is because of some dysfunctional thyroid disorders. Diabetes, Celiac disease, and illnesses can delay period and give a negative pregnancy test. All these conditions have no relation to your pregnancy. You need to consult the doctor if you continue to get a negative test for more than 3 weeks. A negative Pregnancy test at 4 weeks is the possibly longest you can wait before consulting your doctor. But this only when you are sure that the symptoms you are seeing are because of pregnancy. There are conditions which can mimic pregnancy symptoms. Molar pregnancy is when an abnormal tissue develops in your uterus. This consisting needs medical attention or can cause severe damage. Tubal pregnancy needs surgical removal otherwise you’ll have to get an ovary and tube removed. It will reduce your egg storehouse by half. Endometriosis or polyps can lay benign in your uterus. But later they can lead to dire complications such as permanent loss of fertility. When you are pregnant and have a negative test result, it is a false negative pregnancy test. There are many reasons for getting a false negative test. It is a common occurrence. Taking the test at an early stage of pregnancy gives a false negative pregnancy test. Using a dilute urine sample gives a false negative pregnancy test. Read more: What To Do After A False Negative Pregnancy Test? False negative pregnancy tests are wrong because they are not correct. They conceal the real condition of your uterus. A negative result can be wrong, and your doubt is right when you see symptoms of pregnancy in you. Disregarding a faint positive as an evap line is also a reason for the negative result being wrong. The most probable cause of a negative test result is that you are not pregnant. All the reasons for false negative pregnancy test are causes of wrong results. You can use an early pregnancy test by First Response or Clearblue to get an early positive pregnancy test. Hospital pregnancy tests or blood pregnancy test is also a way of countering the odds of getting an early positive pregnancy test. Previous articleHow Heavy Is Implantation Bleeding? Next article12 Weeks Pregnant: What To Expect?